Even paradise can get stale. Here in Whistler, locals often speak of the “Whistler Bubble” and their desire to escape this bubble from time to time. Fall is traditionally a time when many locals take extended holidays out of town, as the tourist trade quiets down substantially and, if ski bums get their wish, Whistler weather can get quite gloomy this time of year. Sun-drenched surf retreats to Latin America or Indonesia are probably the current favourite Whistler escape, but Whistlerites are well-travelled people by nature. Come October you can find our locals scattered across the far corners of the globe. 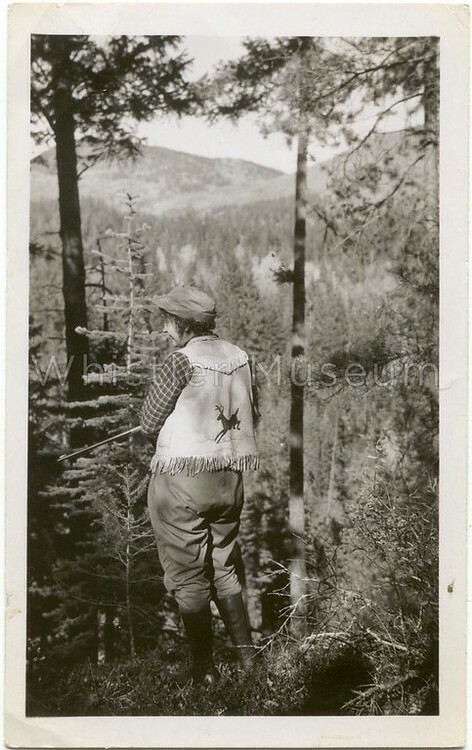 Myrtle hunting near Mahood Lake, circa 1950s, perhaps searching for a big stag deer like the one depicted on her rather fashionable hunting vest. This tradition of Whistler residents turning the tables and becoming tourists in the Fall is older than many might think. Our valley’s original vacation hosts, Myrtle and Alex Philip of Rainbow Lodge fame, were always keen to pack their bags and get out of town once their busy summer season wound down. 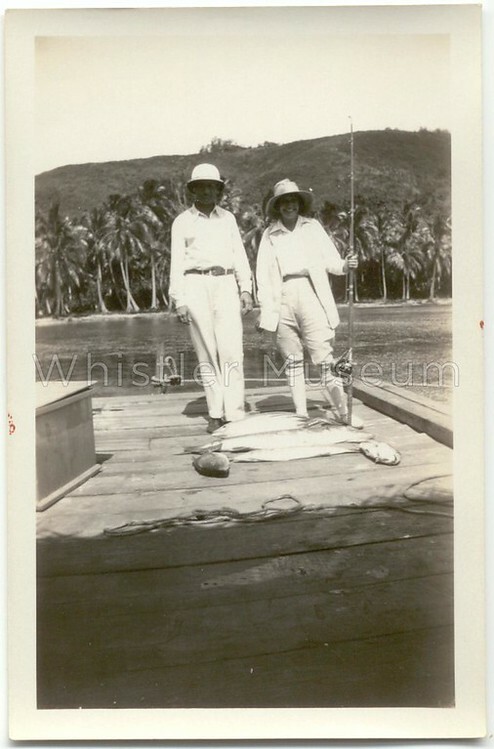 The Phillip’s were avid anglers, and thus many of their getaways focused on fishing. They made several autumn excursions to visit their friends Baldwin & Grace Naismith, who had a cabin on Mahood Lake in the Cariboo region of central British Columbia. Myrtle casting out into Bridge Creek, southwest of Mahood Lake, 1929. Not only did the Mahood Lake area offer much larger fish than Alta Lake, lake trout in particular, it must have been a pleasure for the Philip’s to switch roles and be guests rather than hosts in this beautiful setting. 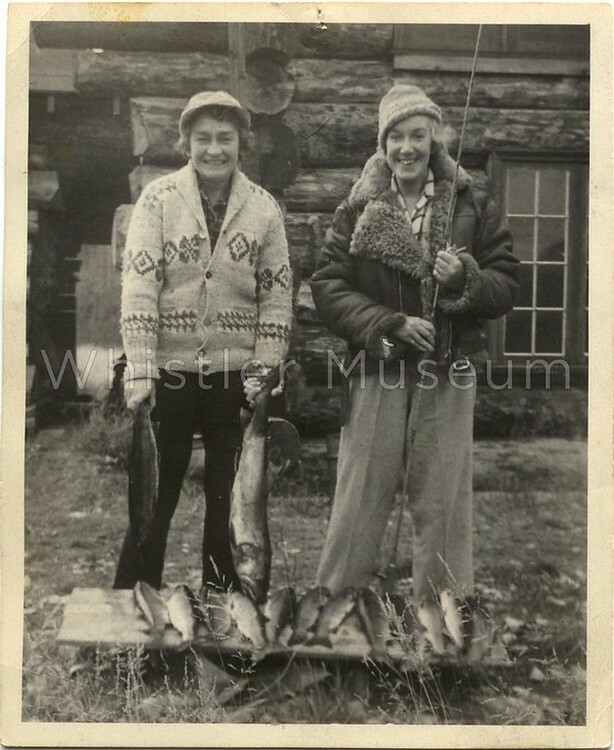 Myrtle with her close friend Grace Naismith and the day’s catch, 1949. The images span the decades and include a wonderful colour photo from 1961 of a smiling Myrtle (now 70 years young) piloting a small boat across Mahood Lake’s glass-calm waters with vivid fall colours framing the shoreline. Myrtle on Mahood Lake, 1961. Just like Myrtle’s hunting vest shown above, in this picture the Philip’s once again demonstrate their fashion sense with their striking white outfits, Alex even wearing his trademark pith helmet. Do you have plans to skip town this fall? 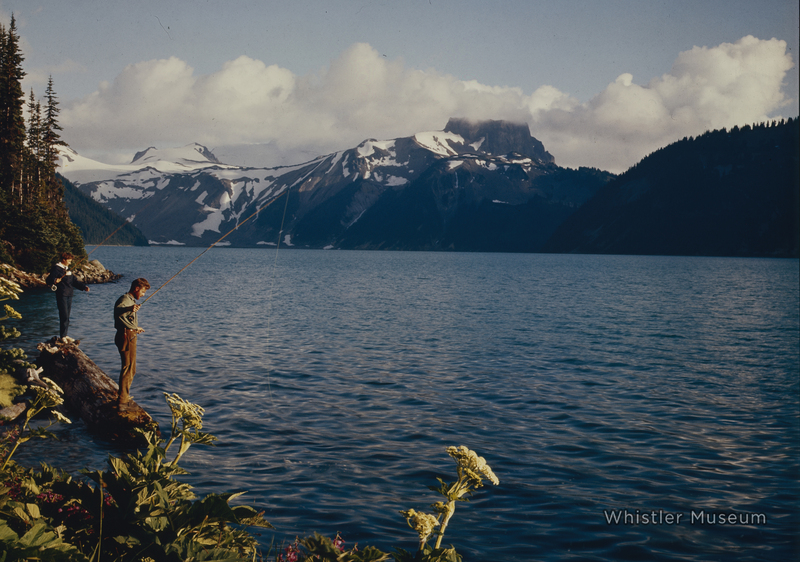 Which would you prefer, fishing in Northern BC, or fishing in the South Pacific? Although contemporary fly fishing gear is full of high-tech advancements like graphite rods and synthetic fly materials, the sport also has a strong traditionalist bent. For many anglers, the romance of bamboo rods, hand-tied flies, and other vintage tackle has almost as much allure as the fish themselves. 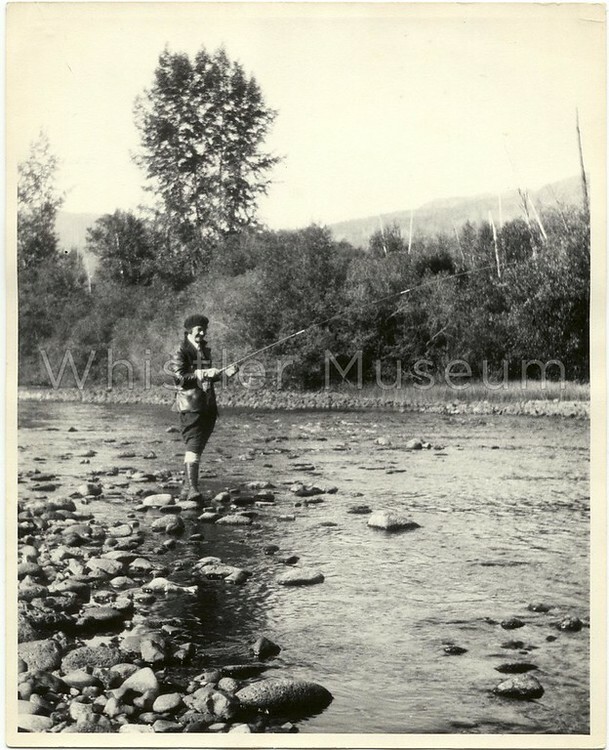 Fly fishing at Myrtle and Alex Philip’s renowned Rainbow Lodge was the Whistler Valley’s first tourist attraction, so the Museum naturally has a lot of fishing gear in our archives, not to mention hundreds of photographs. 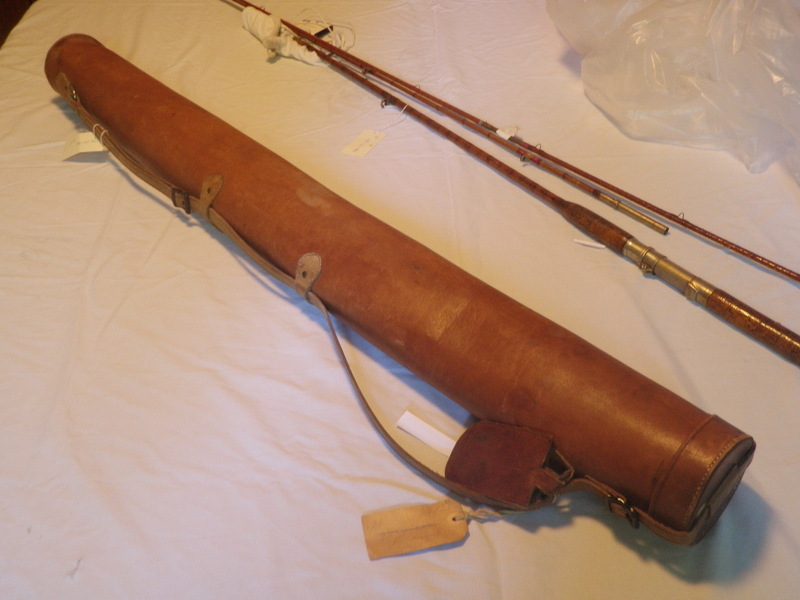 To better understand these artifacts we recently had Brian Niska and Scott Baker-McGarva from Whistler Fly Fishing give us their take on some of the fly-fishing gear in the Philip collection. We were pleasantly surprised to discover that both Brian and Scott are true historians of the sport, providing tons of insight into our collection drawing from their impressive knowledge of the evolution of fishing tackle design. 2 of the Philips fishing rods, and Myrtle’s beatiful leather carrying case. The case still contains a travel tag dating to the Fall of 1961, likely the last time she used it. 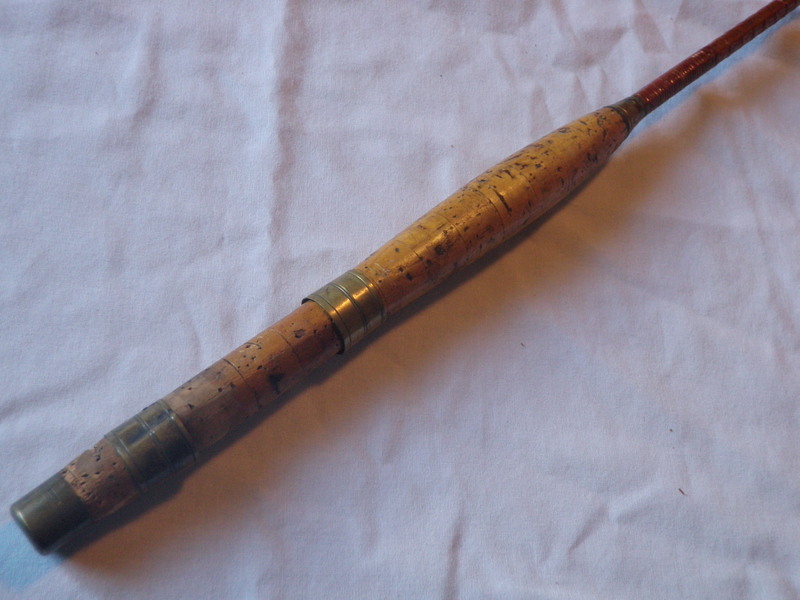 We have several old cane and bamboo rods, some for fly fishing, some for casting and trolling. The handle of one of the Philip’s fly rods. They mostly demonstrate design features from the 1920s and 30s, the heyday of Rainbow Lodge, but the most obvious feature is the amount of use they have all seen. They appear to have been re-varnished multiple times and have many replaced eyes. This makes sense considering that the Philips and their guests were out on the water almost every summer day (and some winter days as well) for decades on end. Considering most rods had to be shipped from the U.K. or the eastern U.S., the rods were irreplaceable workhorses whose lives needed such prolongment. 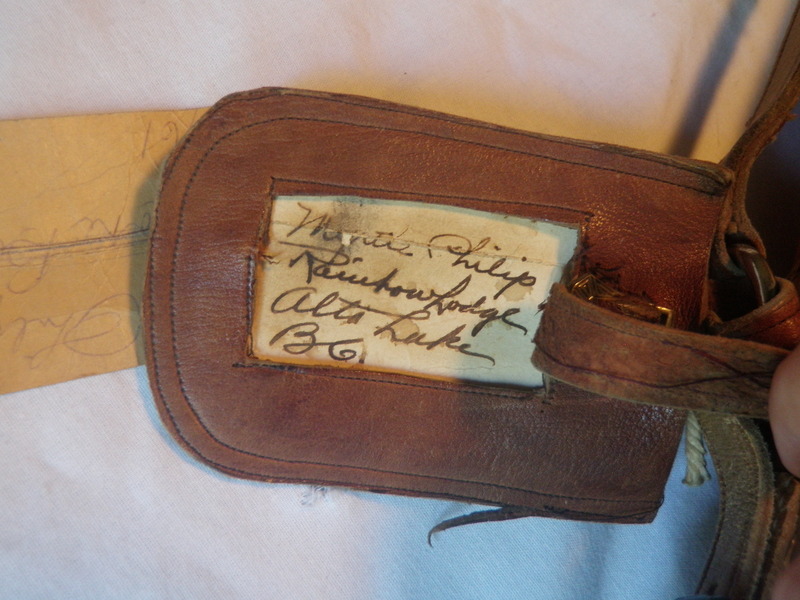 The tag on Myrtle’s leather fishing rod travel case. 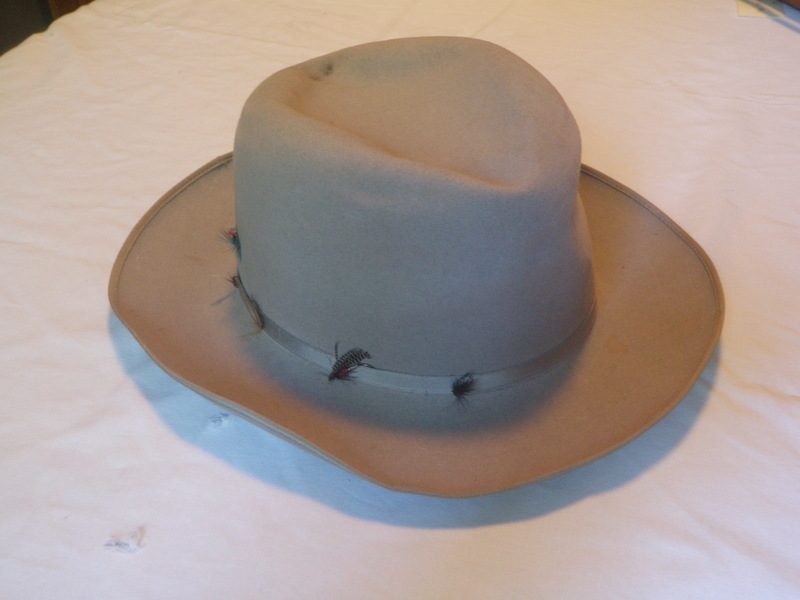 Here we have Alex Philip’s stylish felt fishing hat, a Fedora made by Adam Hats of New York with a special water-repellency treatment for rainy day fishing. Note how the crown is full of an array of traditional wet flies suited to trout fishing in small lakes like Alta. Brass P.D. Malloch fly fishing reel. Made by P.D. Malloch of Perth, Scotland, Scott thinks this particular reel could predate World War One because it is made of brass, and most reels were made of alloys after the war. 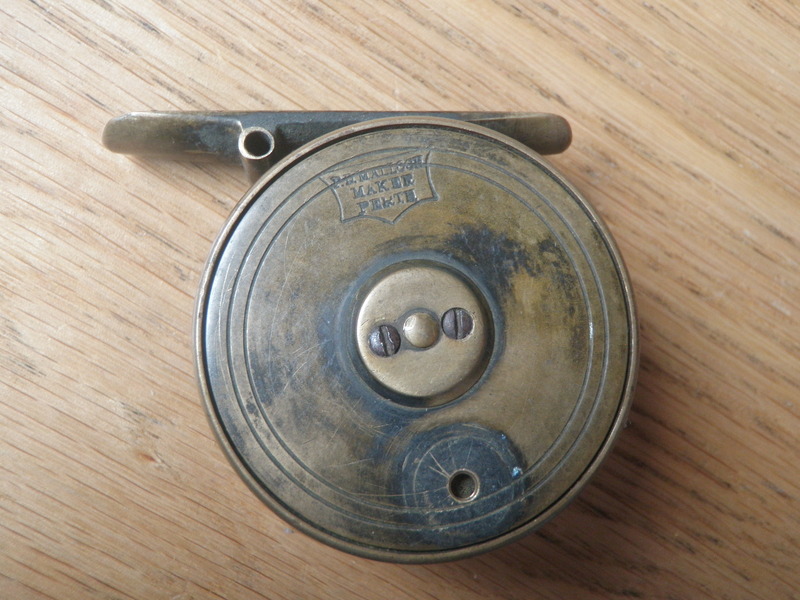 It resembles some of the reels we see in early photos of Alex Philip, and could potentially be one of the earliest fishing reels used at Rainbow Lodge. We contacted the manufacturer for more information but unfortunately their records were destroyed in a fire in 1986. Other interesting odds and ends include the large reel in the top right of this photo, an Ocean City brand fortescue-style reel. Scott described it as a “multiplying salmon reel” best suited for larger fish than we typically find around Whistler. The Philips were dedicated anglers that took annual trips every autumn to Canim and Mahood lakes, northeast of 100 Mile House in the Cariboo region. 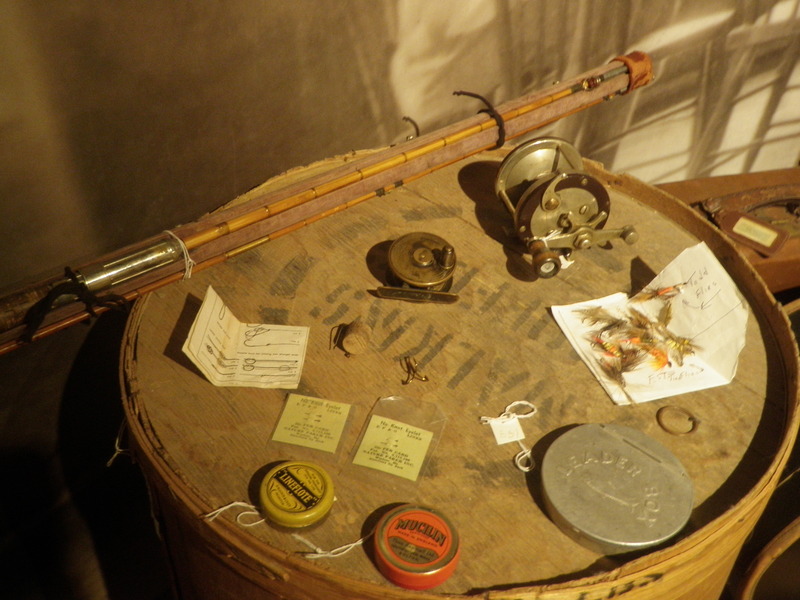 This reel, which was appears to date from the 1930s or 40s, was likely used on these trips. Mucillin and Lineflote (in the small red and yellow tins, both still half full) were grease-like substances used to give silk lines and/or flies buoyancy. Although synthetic lines are much more common now, Mucillin is actually still sold today in packaging nearly identical to our examples from the 1930s. Although the lakes don’t provide our valley’s main draw anymore, there is still great fishing to be had. When I was bringing some of our artifacts over to the museum from our off-site storage I actually encountered several people who were on their way to the lake, rod in hand. They were naturally curious about my odd-looking gear, and I’m certain Alex and Myrtle Philip would be equally excited to see their life’s passion alive and well in the Whistler Valley, more than a century after there fateful first casts in Alta Lake. Whistler Backroads is putting on their 12th annual Fishing Derby this Sunday, June 17th at Lakeside Park. All are welcome, registration is free, and they even have some complimentary gear to use on a first-come, first-serve basis. Happy fishing!